MISSION: To change every single person on our planet, one by one, into advocates for climate solutions by talking frankly about our climate crisis and highlighting meaningful, manageable actions that individuals can take right now. Highlight different kinds of solutions on different scales. We need policy change AND individual carbon reductions AND protest AND new technologies AND infrastructure changes AND new restaurants AND climate-conscious architects and contractors and farmers. 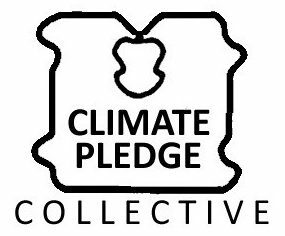 The Climate Pledge Collective encourages people to take whichever actions fit their skill sets, lifestyles and perspectives – the important thing is taking action. Talk-the-talk and Walk-the-walk. You don’t have to be perfect, but you have to try to reduce your own carbon footprint. Try going a vegan for a day or a week. Try a staycation. Try public transit. Even if it doesn’t work out, it will help you talk honestly to others about how it can sometimes be hard to change daily habits – and how it can sometimes be surprisingly easy. I barely noticed that I gave up beef. Trying to change will also help you to identify structural barriers in your community – each barrier is a site where you can organize a new pathway to a low-carbon future. Better, faster, cheaper. We try to design simple tools that people can scale up quickly using resources that they already have access to. That’s why our pledge sheets are printable, so you can put a couple in your bag or pocket and pull them out when you’re talking climate. Using cheap or free technologies also allows us to try things out and then iterate, iterate, iterate in order to learn from our mistakes and make our tools better and better. Filling the Missing Middle Many people are trying to reduce their personal carbon footprints, many organizations are doing an excellent job of organizing protests and political advocacy, experts in all kinds of different fields are rapidly developing technologies and policies that will mitigate our climate crisis – but there aren’t a lot of opportunities for people to get to work on their own schedules guiding their friends and neighbours towards meaningful climate actions. Decentralized. If you’re promoting climate action, building scalable tools and trying to walk-the-walk in your own life – you’re already part of the Climate Pledge Collective. If you’re better at it than we are, you’re welcome to take the lead. We’ll point people in your direction and cheer you on.